Madame Alexander 1993 Collection catalog is 52 pages of color photos of much loved collections. Includes 8" Americana, International, Wizard of Oz, 8" & 10" Peter Pan, Sound of Music, 10" Portrettes, 8", 10" 14" and 21" Scarlett Series, trunk sets, the very special Wendy Loves.... Series, Treetoppers, 14" Changing of the Seasons series - 14" dolls for each season with loads of outfits and accessories, icon classics in 14" size dolls, special 2 and 3 doll sets, 21" Portrait dolls, 21" porcelain dolls, large baby collection and so much more. 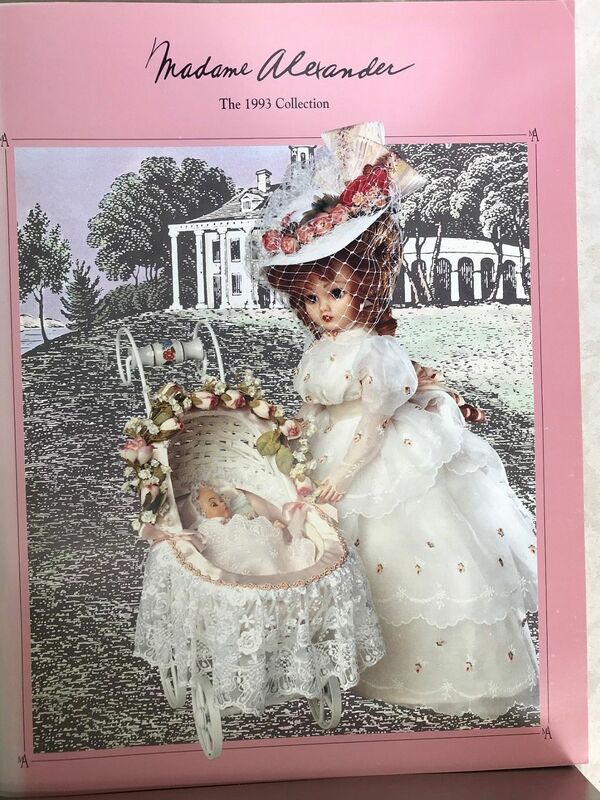 If you collection Madame Alexander dolls, you'll want to collect the Madame Alexander catalogs to be able to identify your dolls, make your wish list and just have fun browsing. Was new in company shipping carton. In stock.